Author: Kris Burm ~ Publisher: Schmidt, 1999 ~ Find It! In Tamsk each player starts the game with 3 hourglasses and 32 rings. The hourglasses are the playing pieces. The object of the game is to get rid of as many rings as possible. Each turn a player must move one of his/her hourglasses and turn it over, next he/she may play a ring in the newly covered space. The more spaces a player visits, the more rings he/she will be able to play. 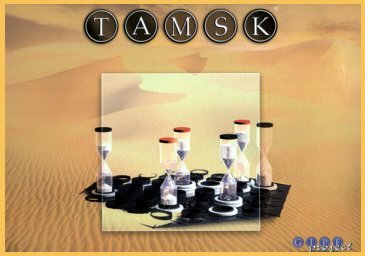 Tamsk introduces time as a substantial strategic elementeach hourglass that runs out of time is lost!